Wonderful Architect designed home majestically located in a private mountain setting adjacent to National Forest with no other homes in sight. The main living level has a huge great room with a 26 foot high cathedral ceiling, large stone fireplace, contemporary kitchen with stainless steel appliances, 6-burner Thermador range, granite counters, and an awesome view of Sawtooth Ridge. There is also a south facing deck with waterfall. The master bedroom wing has a large bedroom and bathroom with double sink, soaking tub and shower. There is also a laundry room and small bedroom (formerly a home office) with a twin bed on this wing. Upstairs off the loft are a bathroom and three bedrooms (two queens and one full). Enjoy the huge recreation room downstairs, with TV/VCR, L-shaped sofa, ping-pong table, poker table, full bath, futon and bunk bed alcove. There are beds for 12, but larger groups may use sofas or bring a blow up mattress. We are architects in San Francisco and designed and built this house in 2006. Raising two boys in the city, we have always known the importance of getting away to the wonderful outdoors that the Tahoe area has to offer. We started the boys skiing, fishing and hiking when they were 2 years old and they still enjoy the same activities today as college students. With the boys now away at school, we have the opportunity to open our home so that other families can partake in the same enjoyment that we have had over the years. This property is conveniently and centrally located. About equidistant to Truckee and Lake Tahoe (Tahoe City), and only 1.5 miles to the Squaw Valley entrance, this location is ideal. The house is designed for families or goups and is very spacious. It has been designed in the Tahoe venacular and built majestically into the hillside to capture the view. Top of the line kitchen appliances and large dining room create a great opportunity for family and friends to dine together. The house borders National Forest land on two sides and no other houses are visible from the house. There is plenty of parking available. Great room has large picture windows with view of Sawtooth Ridge. Wood fireplace in great room. Garage if fully stocked with firewood. Thermador 6-burner range, Bosch dishwasher, Built-in microwave, coffee maker, blender and toaster. Bring your own i-tunes set up. Large recreation room with ping-pong table, poker table, full bathroom, L-shaped couch and TV. Cabin was quite big and very conveniently located near Squaw Valley. The owner was very easy to contact and addressed all questions we had very quickly. Lots of firewood was a big plus. Great house for a large family! We really enjoyed our time at Kevin’s house. The location was perfect as it was close to Lake Tahoe, Tahoe City, the Truckee River, and lots of great hiking just outside the door. The house itself is extremely spacious, with a large gathering area for extended families. The furnishings/decor are definitely “rustic,” but work well if you have small kids in your party and are worried about them ruining anything super expensive. Kevin was extremely responsive to our needs and tries hard to make sure his guests’ experiences are great! Our visit was wonderful. The house is very spacious and accommodated our family in every way possible. Plenty of room, the game area was great for the kids and the kitchen was wonderfully stocked with everything we needed for cooking our meals. Thank you for the amazing stay! My family and I loved staying here. We loved everything about the cabin. From strolling along the river (across the street) to playing ping pong late into the night, to enjoying meals together. There were plenty of beds and so much space to just hang out and enjoy each other’s company. We were able to make it to Tahoe City - Commons Beach and Lake Forest Beach. We hiked near Squaw Valley and enjoyed all the shops in the Valley. The grocery store was less than ten minutes away too! I actually liked that the TV was downstairs and not in the main room. This made it so that my entire family spent quality time together, playing games and talking before bed. The kids loved exploring all the rooms and we were able to fill their blow up pool on the deck. Kevin was a great host and we will definitely be coming back! Fabulous house and a setup for a family vacation with multiple families and young children. Easy access to great hiking and all the activities in the surrounding area. Would definitely recommend. My daughter got married last weekend in Tahoe City and we needed a large home for our family. 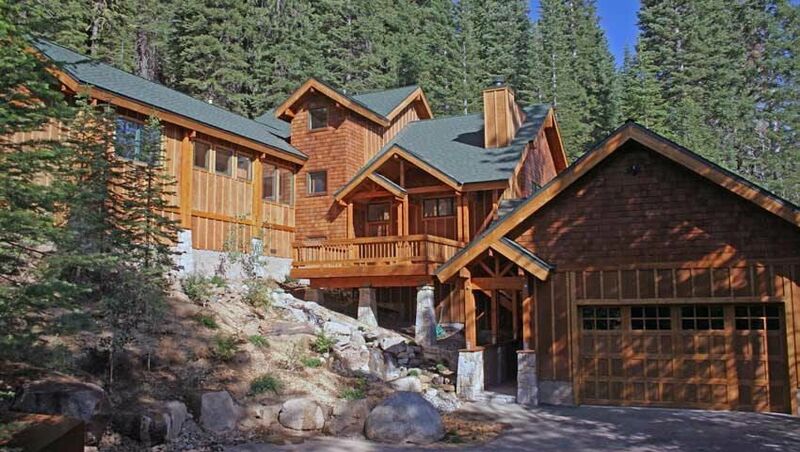 This beautiful home was in a great location between Truckee and Tahoe City. The owner, Kevin, was very helpful, informative, kind and responsive. Just minutes from Squaw Valley and Alpine Meadows, a short walk to the Truckee River, and a short drive to Lake Tahoe and historic Truckee, this property is ideally located for the myriad of outdoor activities available. Contact owner for rental agreement.